The haze and the El Niño phenomenon deserve greater attention. 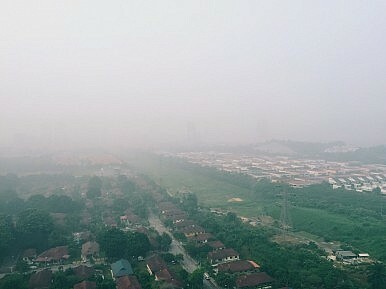 The haze has become an annual problem involving Indonesia, Singapore, and Malaysia. This year, the haze is darker and more hazardous than ever; but this time it has reached the skies of south Thailand and some parts of southern Mindanao in the Philippines. Some are also insisting that small farmers should be probed for causing the forest fires in western Indonesia. But while traditional farm practices should be reviewed, the more essential issue is the unsustainable production being pursued by large plantation companies. Besides, traditional farming has existed for decades if not hundreds of years without generating a massive haze pollution across borders. The haze is a reminder for regional leaders to think of innovative solutions to address an old problem. Offers of financial and technical assistance must be welcomed, regional economic initiatives must be expanded, and cross-boundary interventions must be given a chance to work. The haze should also alert the public about the direct link between human activities and environmental degradation. There’s nothing mysterious about the haze: stop the forest burning to bring back a clearer sky and cleaner air. But this requires more than just enforcing of environment laws. Countries must be persuaded to review their economic models and growth targets, the business sector must be enticed to adopt a sustainable production output, and consumers must be informed to buy less and to choose only the products that do not harm the environment. As Southeast Asian countries prepare to integrate their respective economies, they should also reconsider the impact of this undertaking on the region’s ecological integrity. Should traditional economic indicators such as high production levels, profitability, and expanding trade surplus trump other concerns such as environmental sustainability? How Southeast Asia will address the haze issue could determine the future of the region in terms of its viability as a developing bloc of livable nations. Another concern requiring regional discussion and action is the recurring El Niño or the prolonged drought affecting the lives of millions of farmers. El Niño is worse and deadlier than haze, but it is less visible and evokes a quieter indignation from urban residents. Before Typhoon Koppu devastated northern Philippines last weekend, farmers there have been reeling from the harsh impact of El Niño in recent months. During his weekly speeches aired on national television, Thailand Prime Minister Prayut Chan-o-cha never forgets to remind his rural constituency to support state programs on irrigation and other measures in response to the El Niño which is unusually more intense this year. Southeast Asia may be more famous because of its cosmopolitan cities such as Singapore, Bangkok, and Kuala Lumpur or its exotic beach destinations in Phuket, Bali, and Palawan; but this rising region is primarily an agglomeration of agricultural economies. El Niño affects not just the region’s food security and the export of food crops, but also the backbone of its economy. It is particularly ruinous to ordinary farmers. As El Niño stalks Southeast Asia, the region’s economic prospects also falters. El Niño should lead us to rethink the relevance of several trade agreements that some Southeast Asian governments are negotiating with other bigger and more developed countries. Should Southeast Asia first address the impact of El Niño as a regional formation? Should this inspire the implementation of a bold climate action that will benefit all economies in the region? In relation to the trade agreements concocted by richer countries, the more crucial issue to ask is whether these economic instruments will uplift the lives of farmers who are already suffering from El Niño, or whether the farmers will lose from unfair trade competition. The haze and El Niño are more than just minor concerns affecting the environment. They are not just an inconvenience. They destroy lives, weaken economies. and constitute a national security threat. Choking from the haze and coping with El Niño, is it the right time for Southeast Asian counties to sign new and bold but divisive trade commitments?